We knew that 2011 would be a big year for milestone birthdays. D’s father was turning 80, and D’s sister would be 40 during the summer. J also would celebrate a significant birthday which we will only hint at with vaguery by saying it was somewhere between 39 and 41. 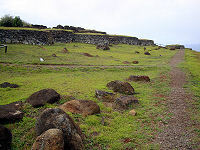 D wanted to go somewhere special for the occasion, and he ran through the options – romantic European capital, romantic beach resort, romantic cruise - but decided on romantic archaeological wonder. 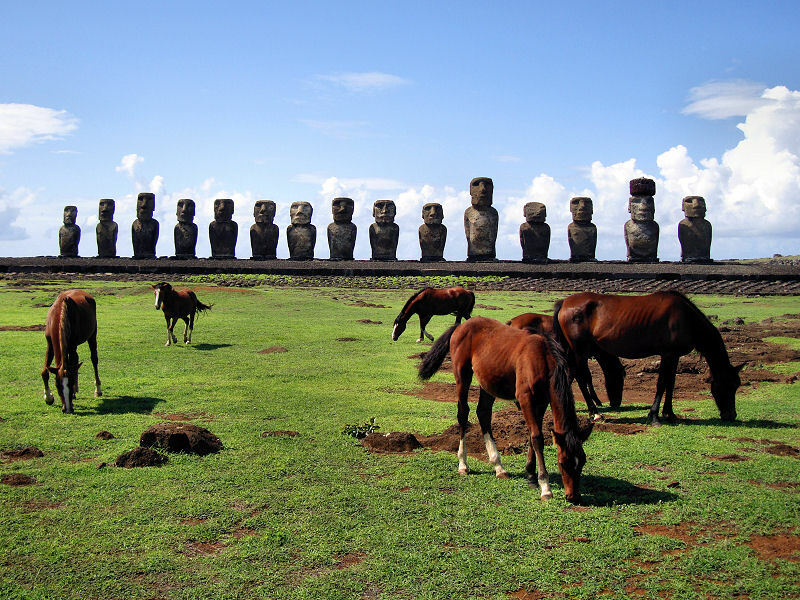 Easter Island seemed like an ideal destination in that it was remote, had beaches, was in a region we had not yet been, and was one of the world’s unique wonders. 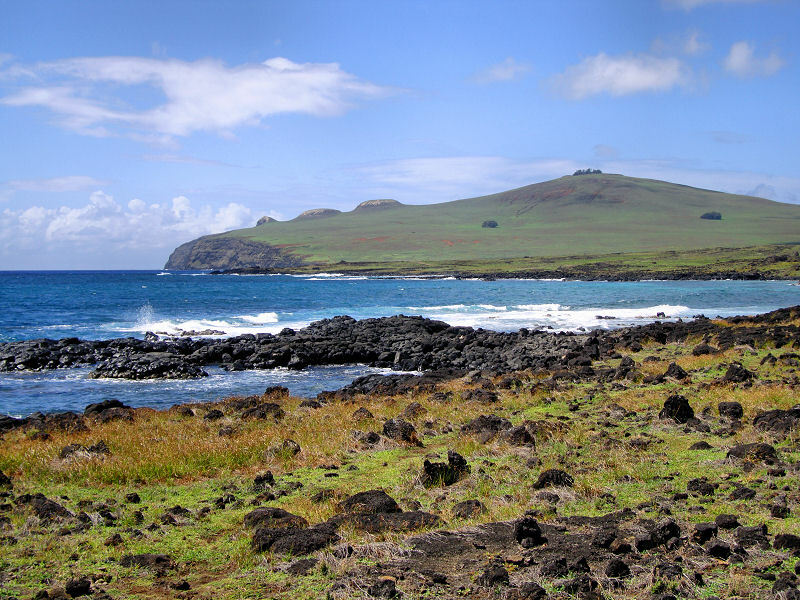 Getting to the most remote inhabited island on Earth is no easy task. 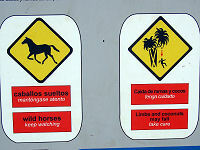 We had three 6 hour flights ahead of us that would take an entire day of our vacation when factoring in layovers. No matter how many times we have run through the drill in the past, we seem to be inevitably late getting to the airport to begin our vacations. This time was no different. Despite pulling all-nighters to wrap up some work assignments and to pack, we were running an hour late in the morning. 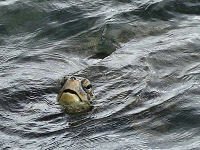 As D went through his pre-departure check of the house, he found himself in ankle deep water in the basement. The hot water heater was overflowing. 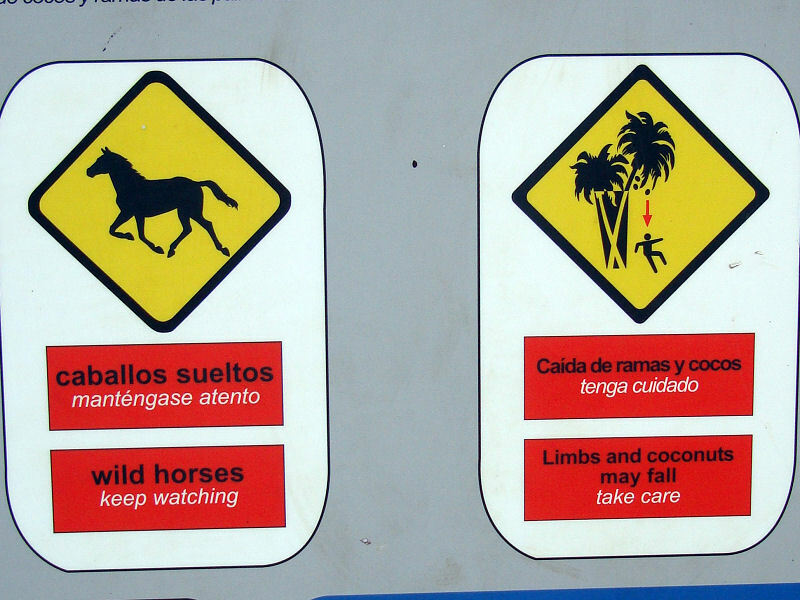 We scrambled to figure out what to do. If we tried to remedy the problem, we would clearly miss our flight, and the next one wasn’t for three more days. The whole trip would have to be cancelled. We were out of time and had to make a decision. We turned of the water main, cut-off the gas, and jumped in the car. The entire mess would have to be dealt with once we got back. 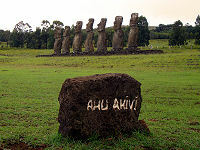 When we finally touched down on Easter Island, it was dark, raining, and 5:30 am. We were both delirious from sleep deprivation as we held up the line at immigration filling out landing forms that were presumably handed out on the plane. Asleep on our feet, we waited for our bags to come out on the delivery system that had to be stopped every few minutes because of pile-ups. 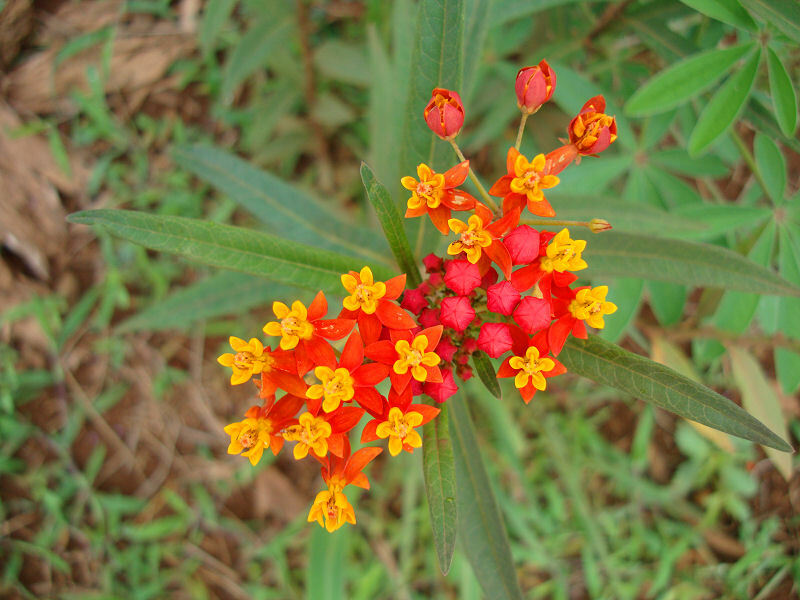 We stumbled out of the airport and into the welcoming arms of Elvira, the proprietor of our lodgings for the week, who presented us each with a lei, shuffled us into her waiting car, and led us to our room for a hot shower and some shut-eye. 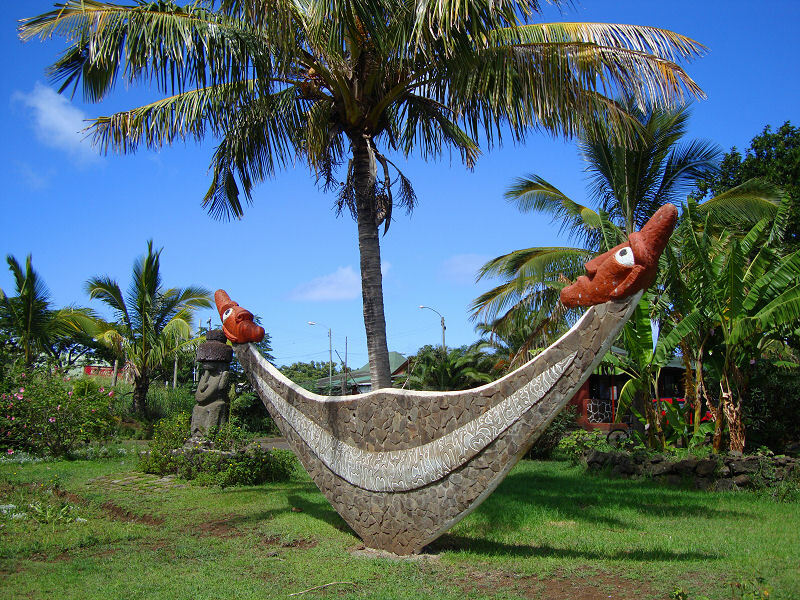 Hanga Roa is the only town on the island, and exploring it, as we did the following day, one soon realizes that street names are forsaken for landmarks. Many businesses don’t have street numbers so we began referring to streets as “Post Office Street”, “Market Street, “Gas Station Street”, etc. What makes this system work is that there is just about only one of everything. 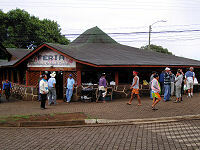 Like any small town (the population is around 5,000) everyone seems to know each other. 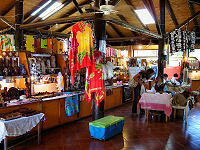 The inhabitants are very friendly and invariably say “Hola” in passing – even to tourists. The population soars if you count the dogs that roam around town. They are pretty friendly, hoping that a scrap will eventually fall from your table, and only show their teeth when they approach the territory of a rival pack. We had a German shepherd mongrel adopt us during our stay, and she escorted us through town each day, stopping only when we hiked out of town or was chased away by a rival. 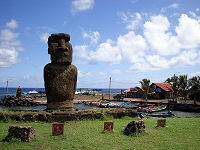 The universal warning in all of the guidebooks is that Easter Island is expensive. Everything is shipped in from Chile, so you can expect to pay about $2 for a soda, $5 for a beer, and about $70 for a decent meal with drinks. It’s like living in an airport for a week. 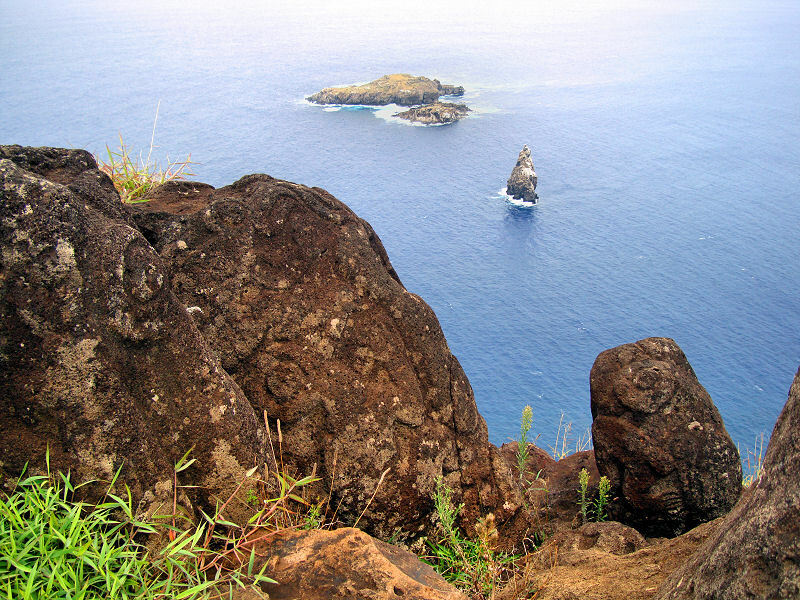 Just south of town is Rano Kau, the second oldest of three volcanoes that make up the island. 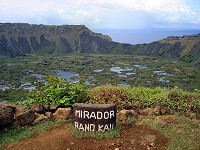 We began around midday to hike the footpath that led straight up to the caldera. 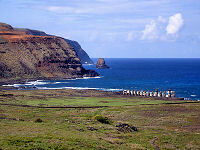 The views back toward Hanga Roa and the island beyond were splendid. 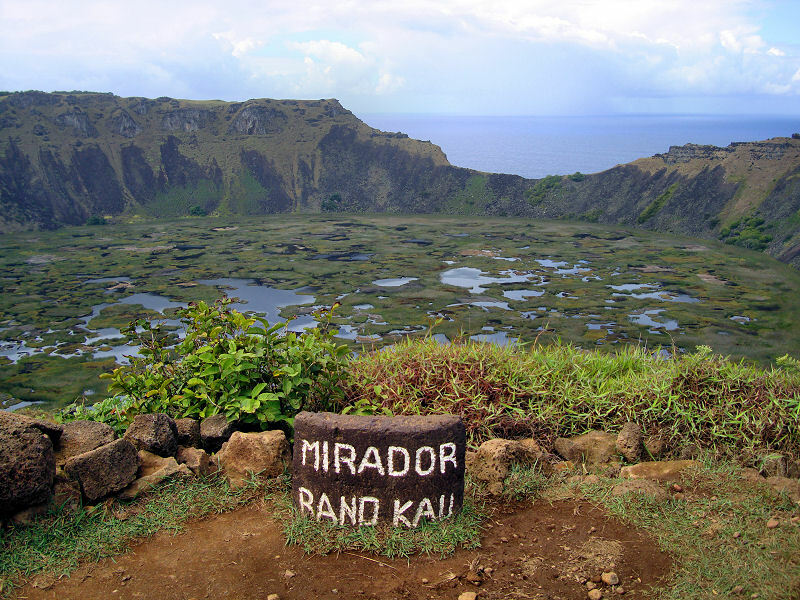 The caldera itself is filled with rainwater (the traditional source of drinking water for the people of Easter Island) with floating plant islands. 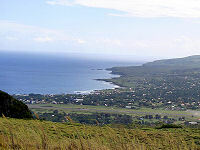 Along one side of the crater situated above the ocean are the ruins of Orongo. This complex of drystone houses and petroglyphs served as the central point for the annual birdman competition to determine the next island leader. 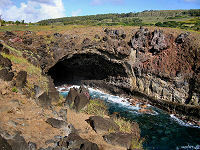 Hopefuls would sponsor contestants that had to descend the cliff face, swim through a mile of shark-infested waters to Manu Rapi island to retrieve an egg from the sooty turn. 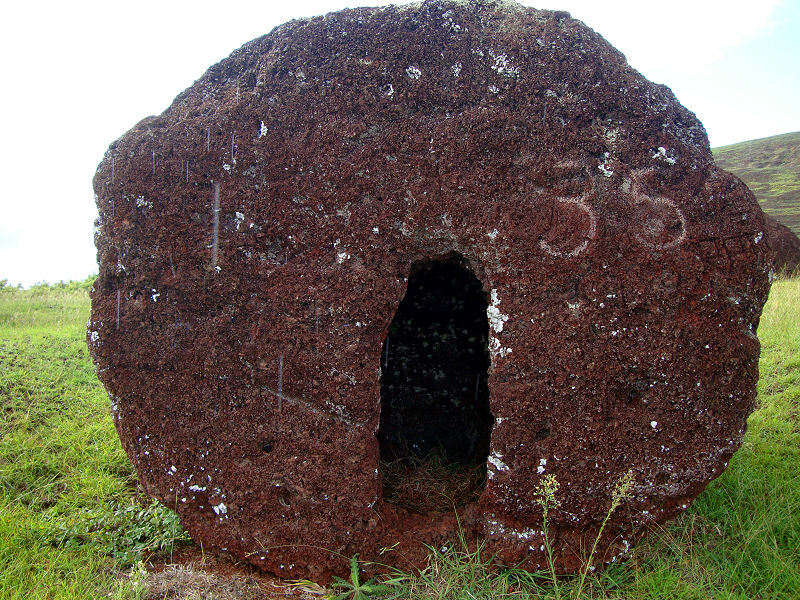 The first contestant to return with an egg intact won the competition and the right for his sponsor to rule for a year. 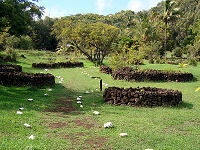 The stone huts were used by priests to oversee the competition. 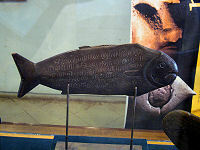 Perhaps dating from the time of the birdman cult, there are a number of wooden tablets found that contain glyphs denoting birds, plants, and animals. 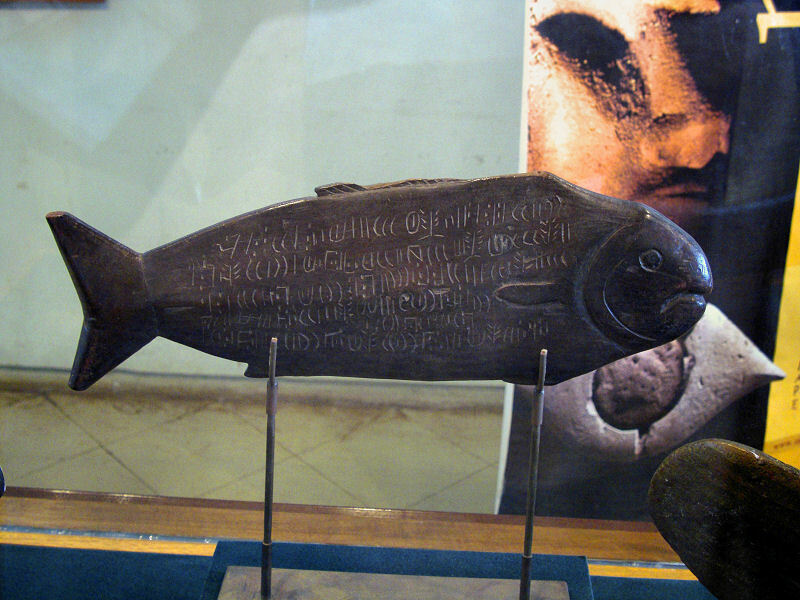 The symbols on the Rongorongo have never been fully deciphered, but the prevailing theory is that they are sacred recitations. Sadly, none of the 20 or so remaining tablets reside on Easter Island having been taken to museums throughout the world. 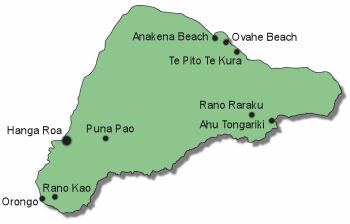 We decided to rent a jeep to reach some of the more distant points of the island. Not only did this give us the convenient mobility we would need to see what we wanted, it also provided us with a safe haven should a sudden rainstorm pop up. 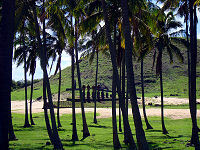 We swung out to the eastern side of the island to stop at Ahu Akahanga. 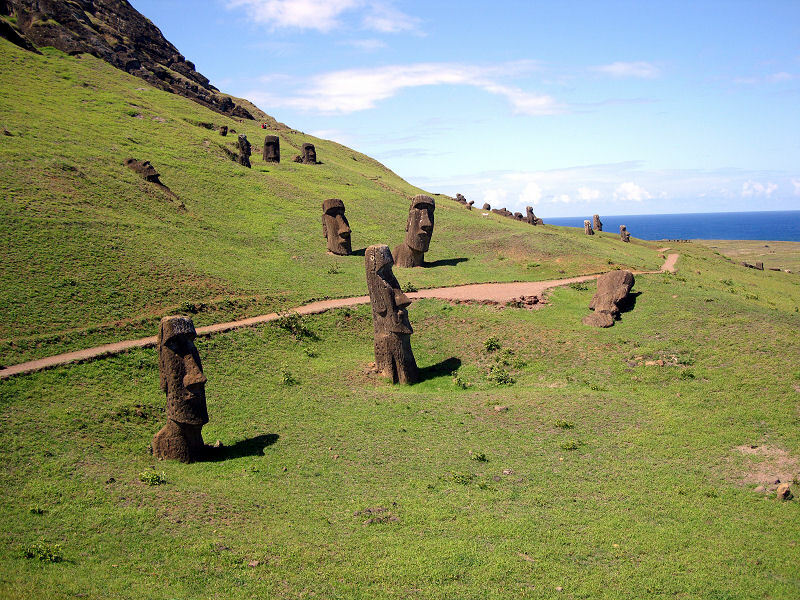 It seemed that we were working our way back in time, but prior to the development of the birdman cult, the islanders engaged in ancestor worship which resulted in the carving and placement of the famous moai statues. 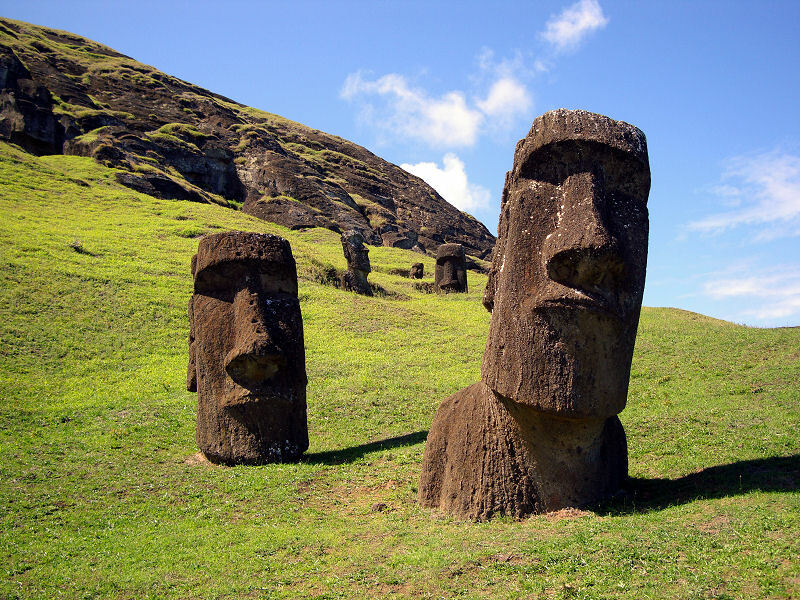 These statues were placed on raised stone platforms called ahu under which burial chambers were created. 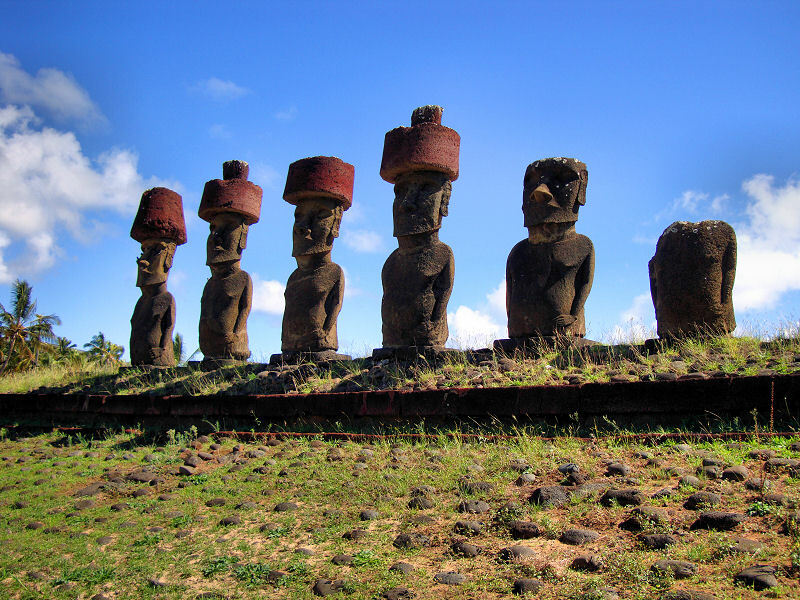 It is believed that the moai represented the dearly departed and since Polynesian culture puts an emphasis on the human head, the heads of the statues are disproportionate in size. 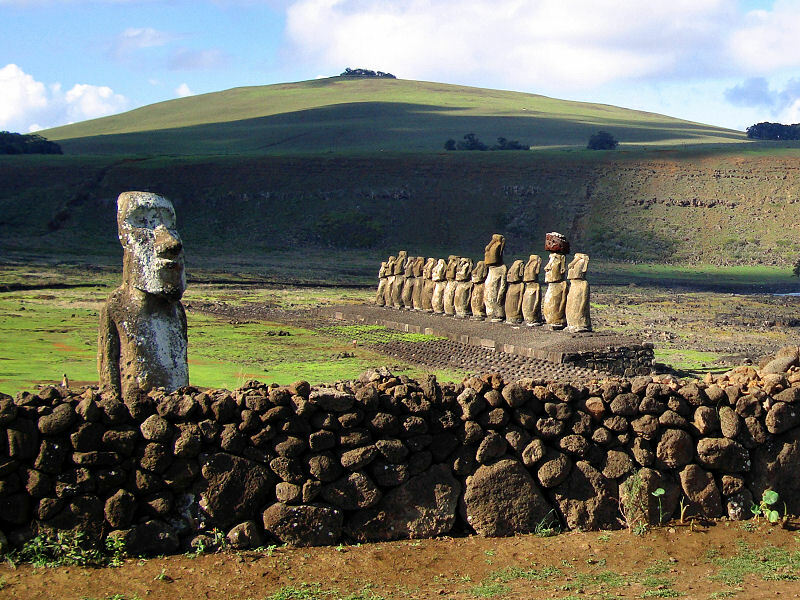 Theories suggest that this statue building era ended badly with warring clans pulling down each other’s moai. This is evidenced by the journals of passing European ships that recorded fewer and fewer moai left standing over time. 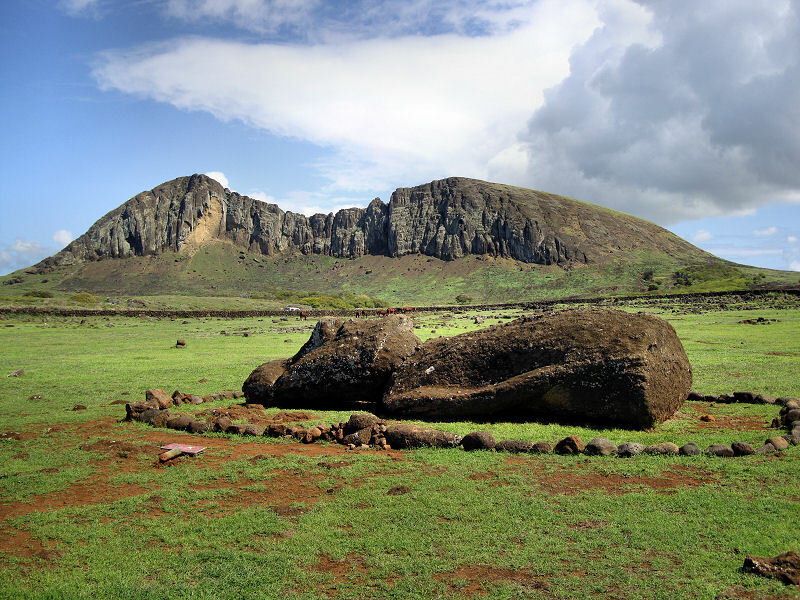 While a number of moai have been restored to their ahus, those at Ahu Akahanga still lay where they were toppled. 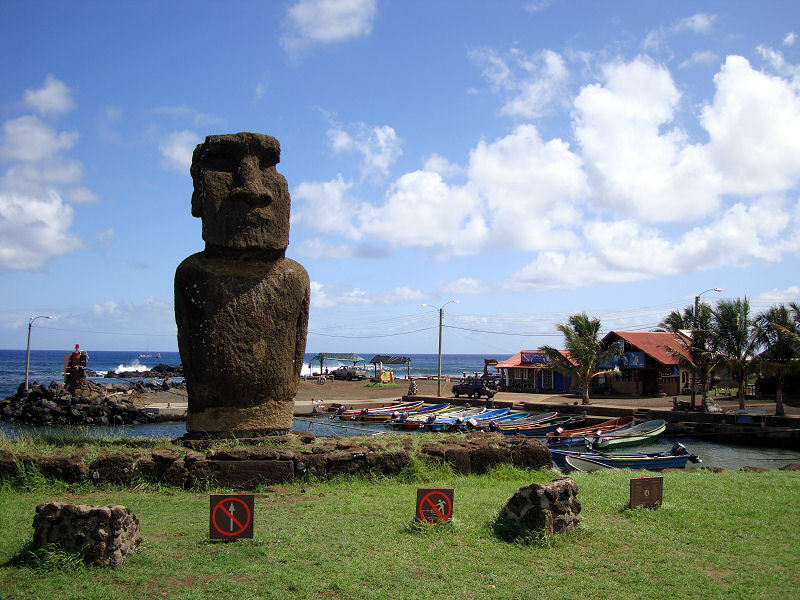 Before pulling down the statue, a pile of stones was placed in such a way that the head would snap off at the neck – a symbolic gesture. 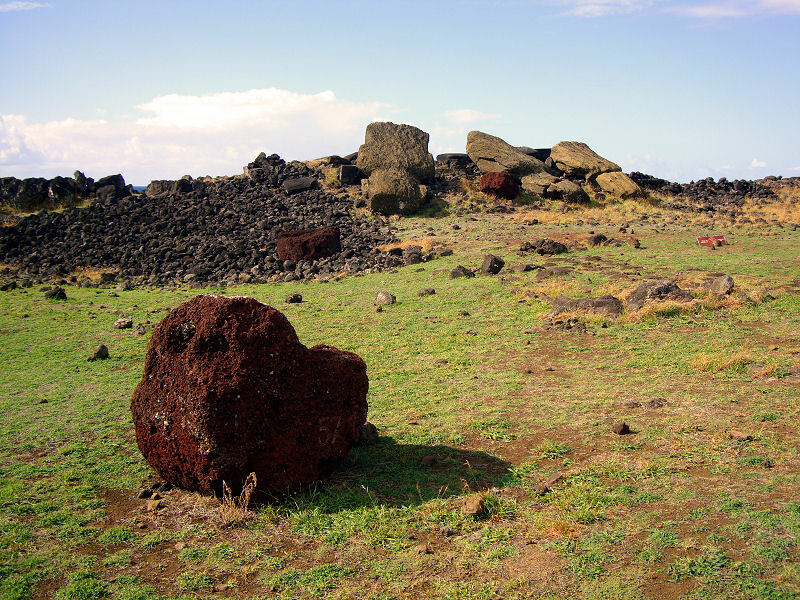 Top knots, the red scoria stones representing the statues hair, rolled away from the ahu to their current positions. It’s all rather tragic that the effort of carving the moai, transporting them across the island, and mounting the top knots was all undone by warring clans. What could have precipitated such destruction? While nobody knows for sure, legend says that it was a clash between the ruling Long Ear class and the subservient Short Ears. 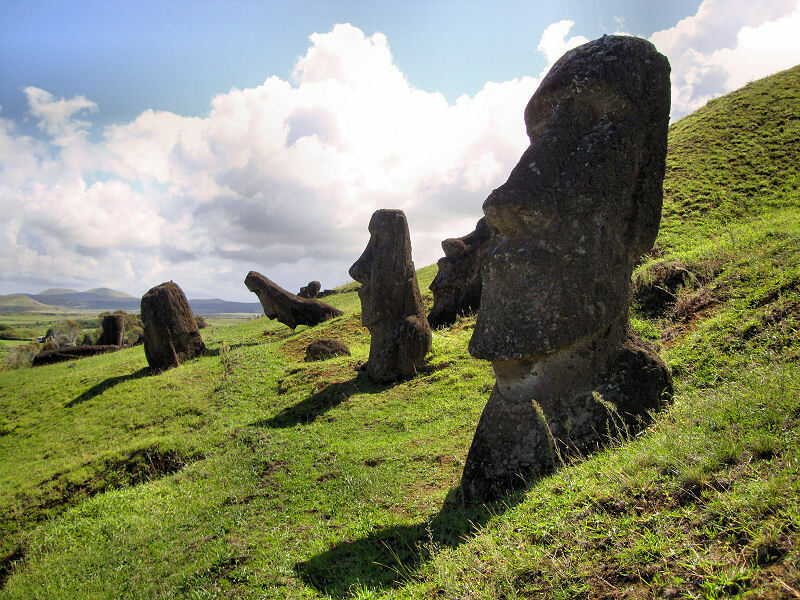 The Long Ears, so-called because of their elongated earlobes produced by inserting discs, commissioned many of the moai as indicated by the elongated ears visible on the statues. The lower class Short Ears were charged with carving, transporting, and erecting the moai. Early theories claimed that the island was almost completely deforested during this statue building era, making it one of the most infamous examples of ecocide ever known. Food became scarcer as new fishing boats could no longer be constructed and anarchy ensued. There are even legends of cannibalism during this time. 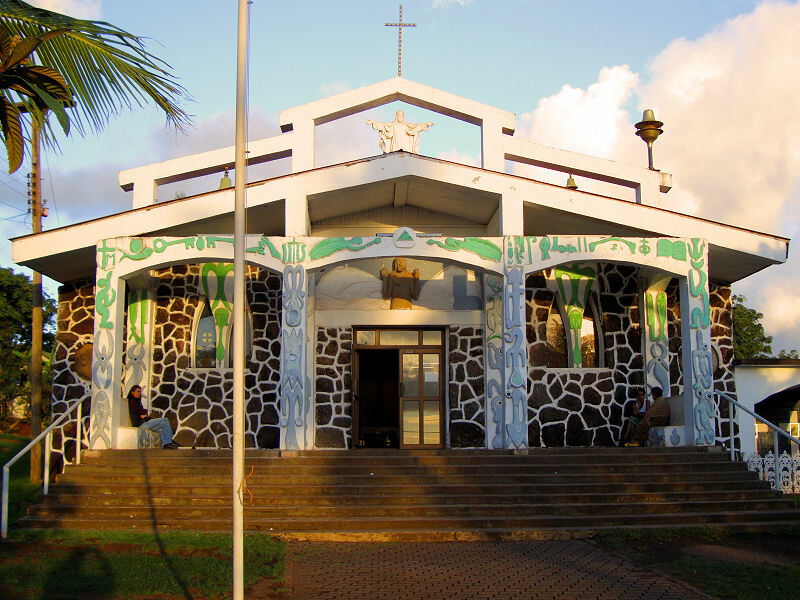 Modern theories profess a combination of causes such as the proliferation of the rat population that fed on palm nuts, conversion of forest to farmland, and even a decline in the sea bird population responsible for producing the guano that fertilized the island. 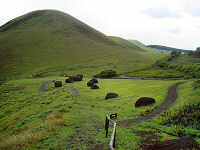 The legend of the Long Ears and Short Ears culminates in a great massacre near the Poike Peninsula. 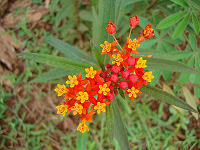 The Long Ears dug a long wood-filled trench to which they intended to lure the Short Ears to a fiery death. In true romantic fashion, the plan, was foiled by a Long Ear woman who loved a Short Ear man, and it was the over-bearing Long Ears who were exterminated in the end. 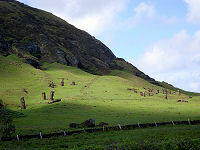 Adjacent to the Poike Peninsula is Ahu Tongariki, the largest ahu with moai restored to their original positions with help from the Japanese government. 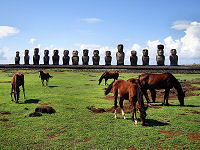 There are fifteen statues altogether, and the site resembles a rugby team standing at attention for the national anthem. 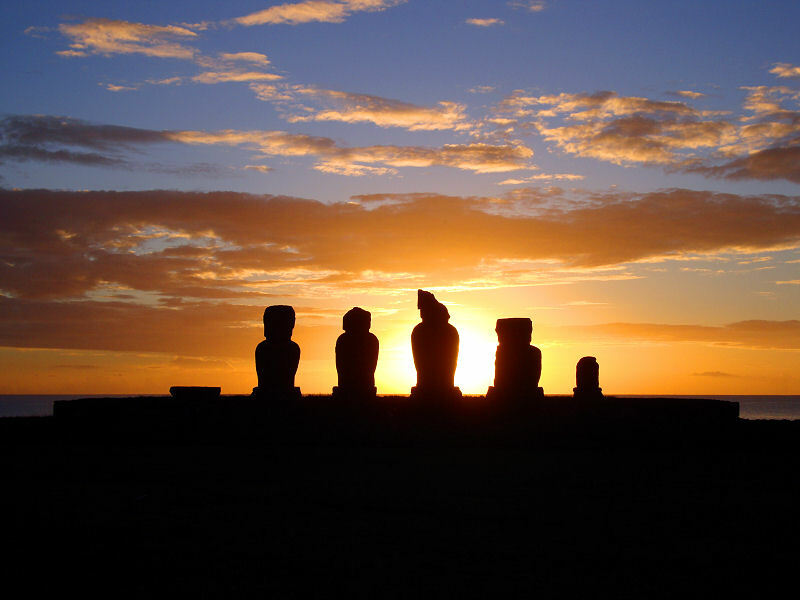 We thought this ahu gave one the best impressions as to the scale of human achievement that the Rapa Nui people were able to attain. Just inland from Ahu Tongariki is the volcanic crater known as Rano Raraku. The basaltic rock here is somewhat softer than other parts of the island, and this cone was used as the quarry to carve the vast majority of moai. 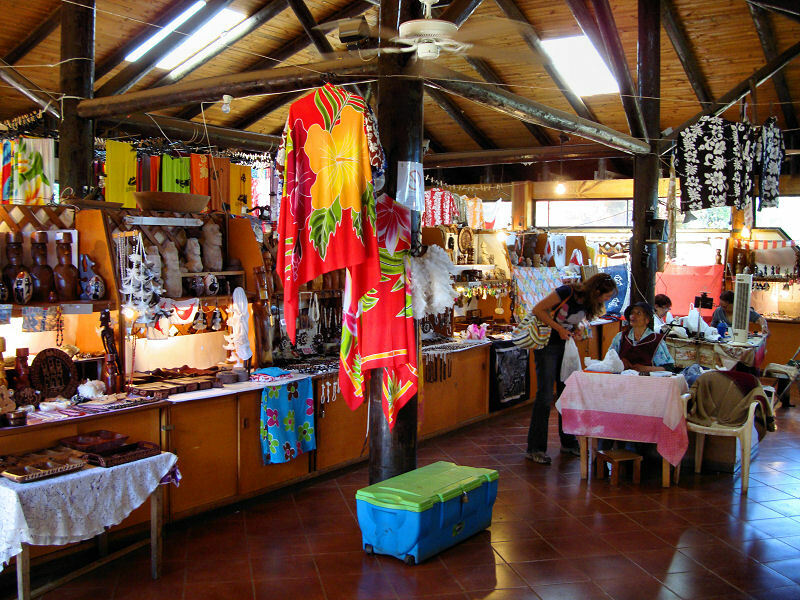 Walking the path leading around the caldera is like a stroll through a moai showroom. 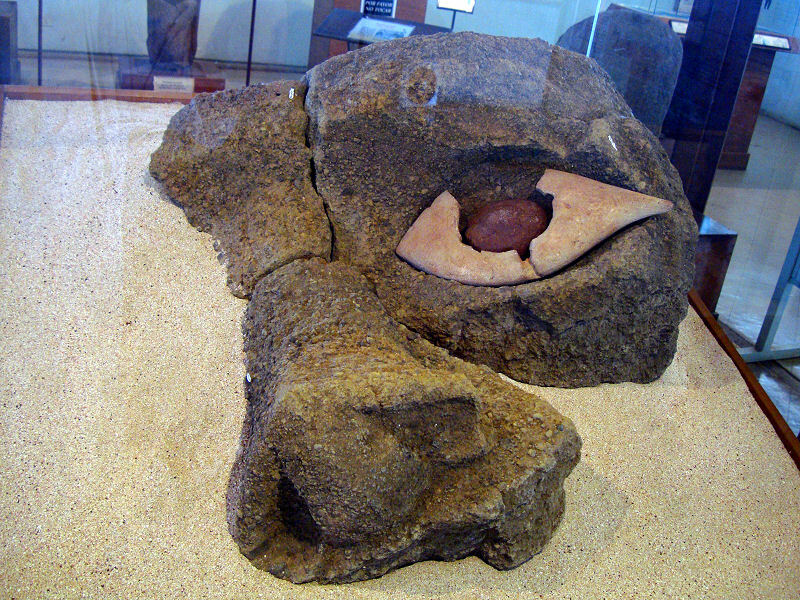 There are almost 500 stone heads in varying orientations strewn around the inside and outside of the cone. 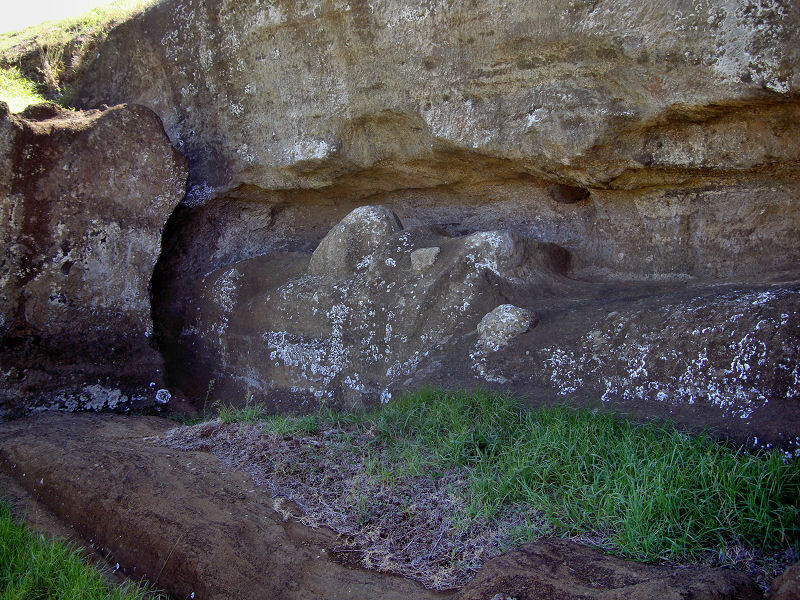 Some are still only partially carved out of the rock. 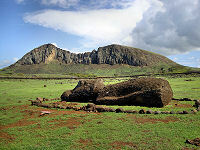 The largest statue ever carved, dubbed El Gigante, has part of its 65 ft long body still connected to the base rock. 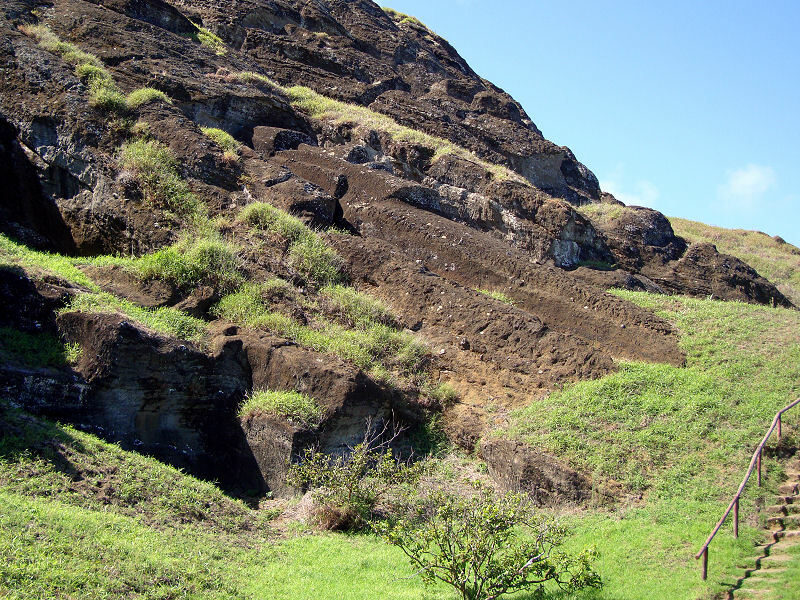 From this quarry, the massive moai were transported to all parts of the island. 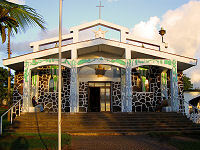 While nobody is sure exactly how this was achieved, many experts agree that it involved wood and rope from the palm trees and a lot of manpower. Another mystery is whether the cessation of the statue-building period was abrupt or gradual. What many do believe is that the resources consumed in constructing, transporting, and erecting the moai put the Rapa Nui civilization in great peril. 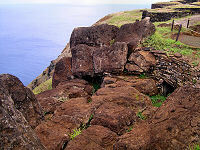 Not too far to the north of Hanga Roa is the quarry at Puna Pao. 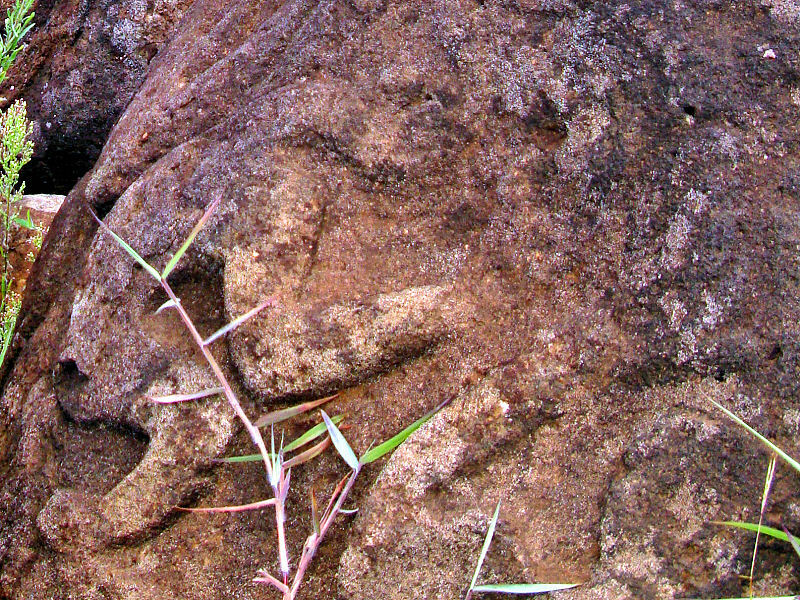 We set out at midday for a moderate hike to check it out. The porous red scoria from this quarry was used to create the topknots that adorned many of the moai. The topknots or pukao represent the hairstyle of the Rapa Nui people in which they would tie their long hair in a knot atop their head. 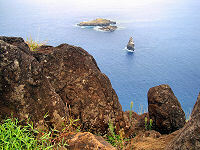 Sometimes it would be dyed using a red slurry of the volcanic rock on the island. 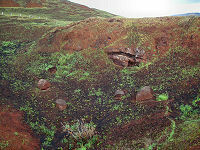 As we made our way up the side of the crater, we saw the rain coming. We scampered back to take cover under one of the few trees available to wait it out. 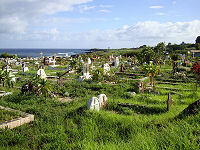 Despite sunshine every day we were on the island, there were always clouds overhead. They would often produce intense showers that would last 10-15 minutes before subsiding. It was a nuisance, but it kept the island lush and verdant. 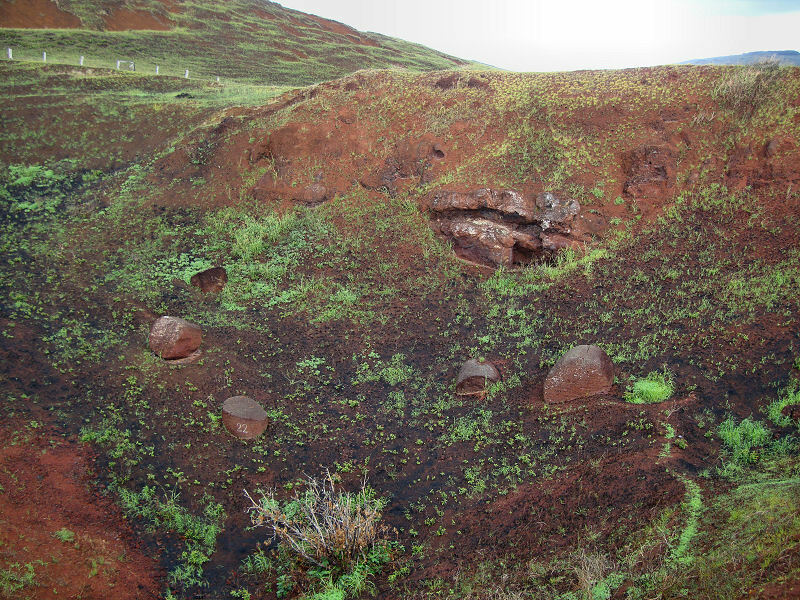 Venturing back into the open, we were pleased to see that the rainstorm had washed away some of the dust and enhanced the reddish color of the quarry. 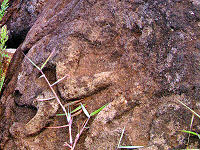 There are several pukao lying in and around the quarry left over from the statue building-era. 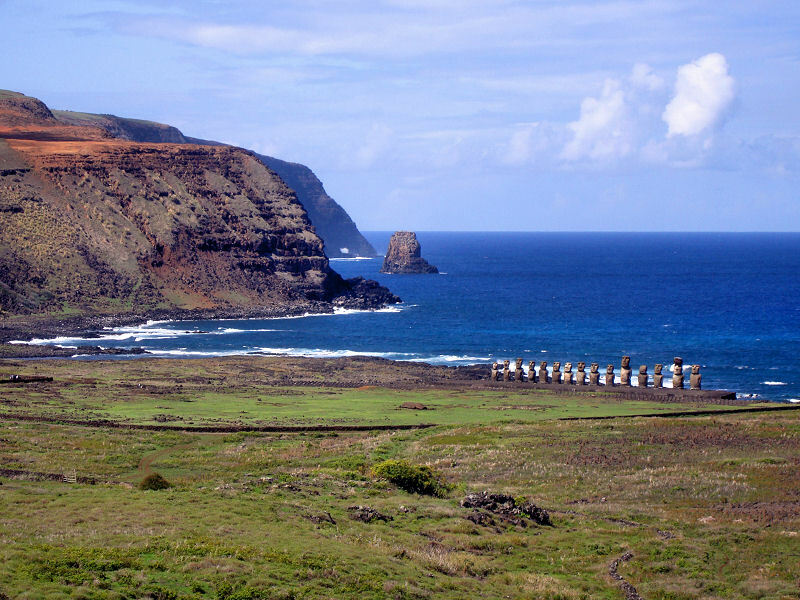 Since they too had to be transported to ahu located all over the island, it was quite normal for them to be rolled to the ahu and finished onsite. 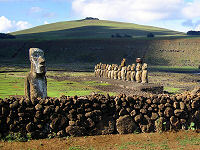 It is believed that not all moai were capped with topknots, and this adornment was somewhat of a status symbol and reserved for the most prominent of moai. Yet another mystery is whether the pukao were placed on the moai before or after they were erected on the ahu. Plausible theories have been proposed for both cases. We soldiered on over some muddy roads to reach the unique Ahu Akivi. 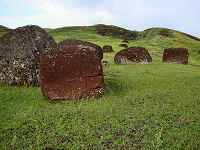 The seven moai here are the only ones that face outward to the sea, but this may be because they are on the only inland ahu. They face directly into the sunset during the Spring Equinox, and it is believed that they represent the seven member advance party that Hotu Matua’a sent to scout the island before his boats of settlers reached the island. Interestingly, the ahu on which the statues stand contain what are apparently European ballast stones. 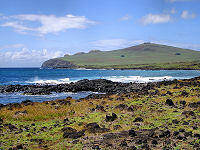 A small peninsula extends from the northern end of the island possessing the only two beaches to speak of on Easter Island. 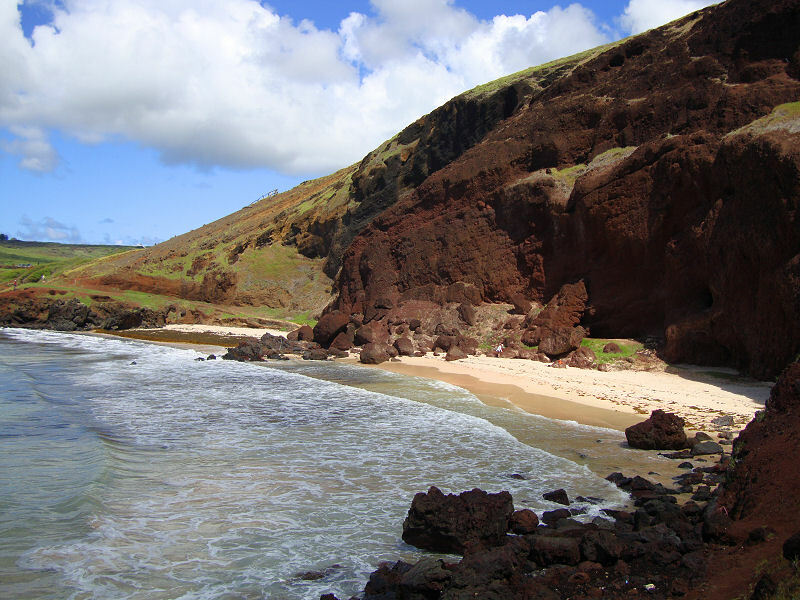 We drove first to Ovahe Beach, the smaller and more secluded of the duo, and found ourselves to be the only ones who braved the rocky climb. 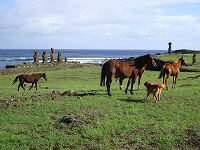 The beach was backed by a cliff wall at the bottom of which was a cave-like opening and at the top of which were precariously positioned horses grazing on the edge. 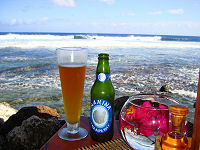 We basked in the Pacific sun for some time as the gentle waves lapped the sand closer and closer to where we sat. 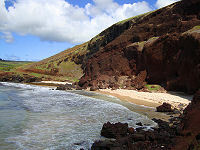 It wasn’t long before we realized that the morning tide would cut us off from the access path, so we packed up our gear and moved to the more popular Anakena Beach on the other side of the peninsula. 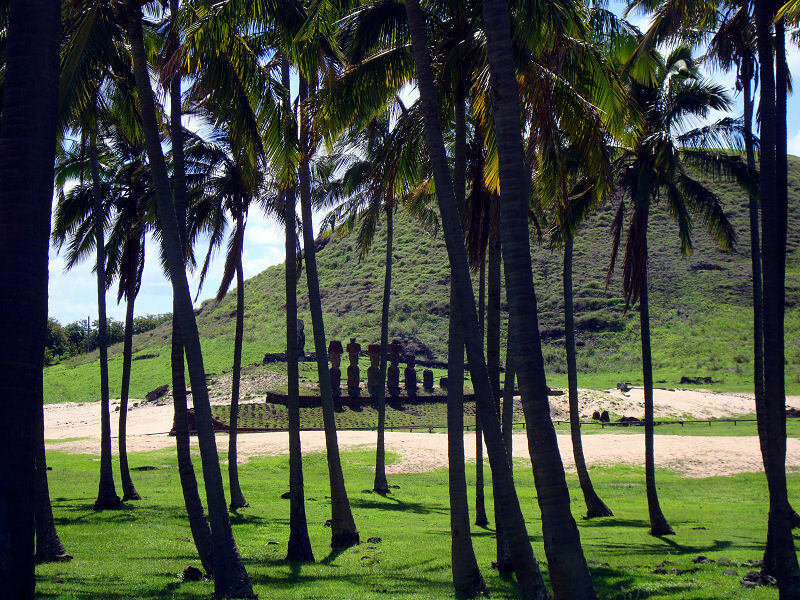 The large crescent-shaped beach at Anakena is as much a tourist attraction for the sand and swimming as it is for the moai that stand guard there. 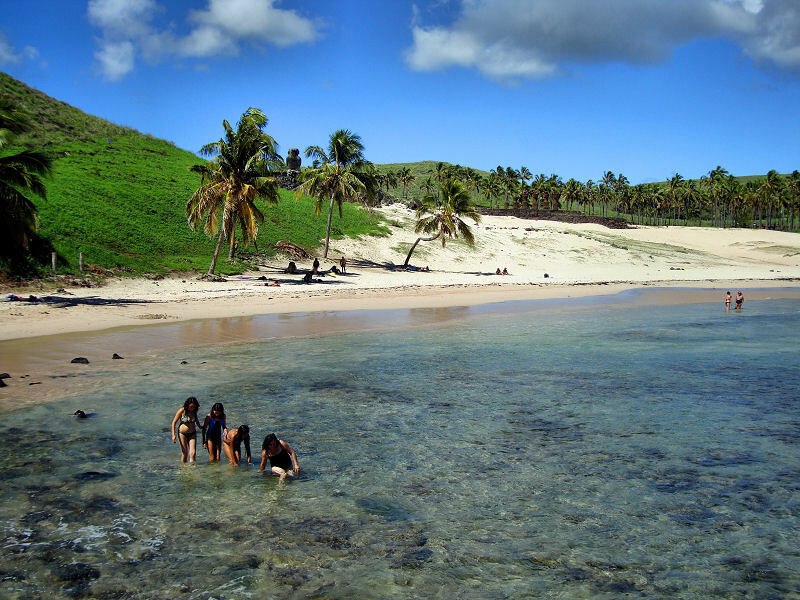 The white sand, curling waves, and palm trees make it an idyllic Polynesian picture. Small shacks selling food and drink stand alongside souvenir stands along the fringes of the beach, but it was not at all crowded. 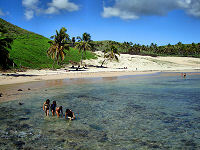 There were as many locals as tourists out to enjoy the fine weather. The principal issue was the lack of shade. Only a few palm trees were near enough to the surf to be useful making them highly coveted. 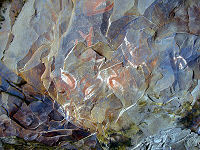 We waited and watched until a small family began to pack up their gear, and then made our move. 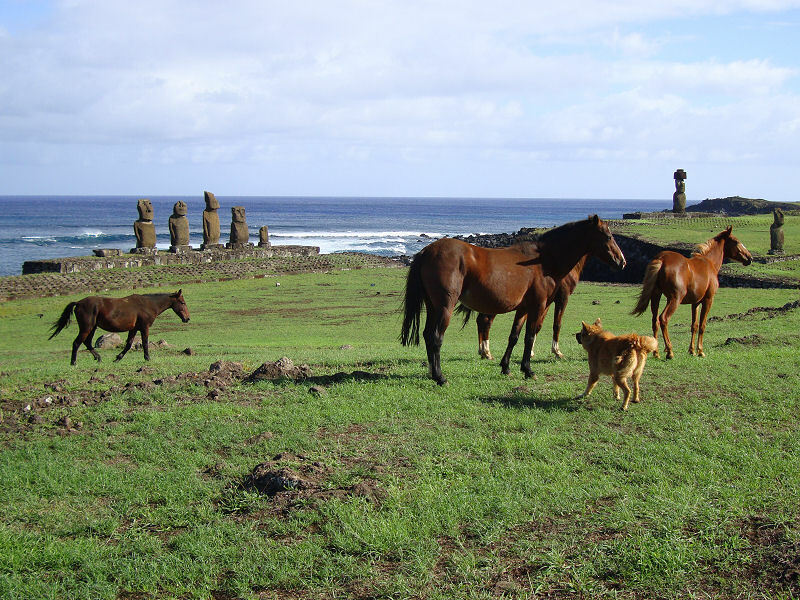 Completing our journey back in Rapa Nui history, we now found ourselves on the beach where human inhabitants are believed to have first come ashore. 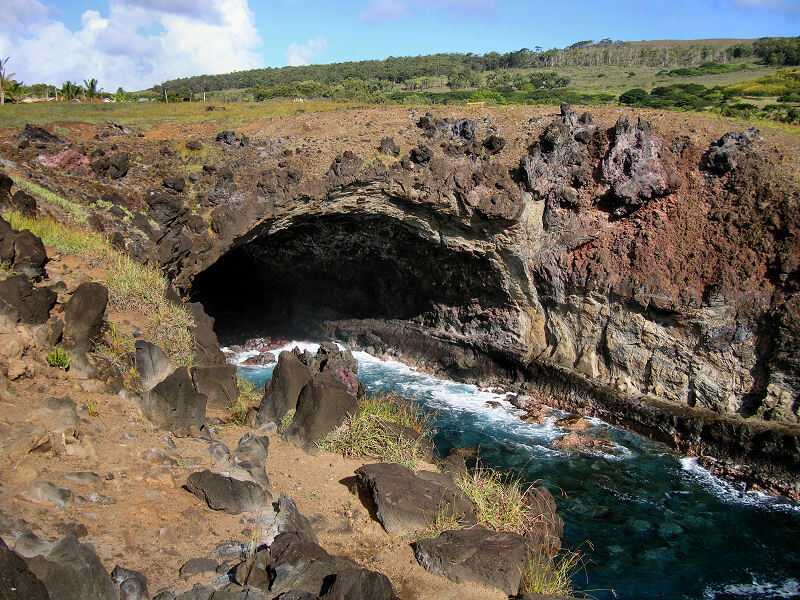 Local legends profess that Hotu Matua’a led two large canoes of Polynesian settlers to the island. 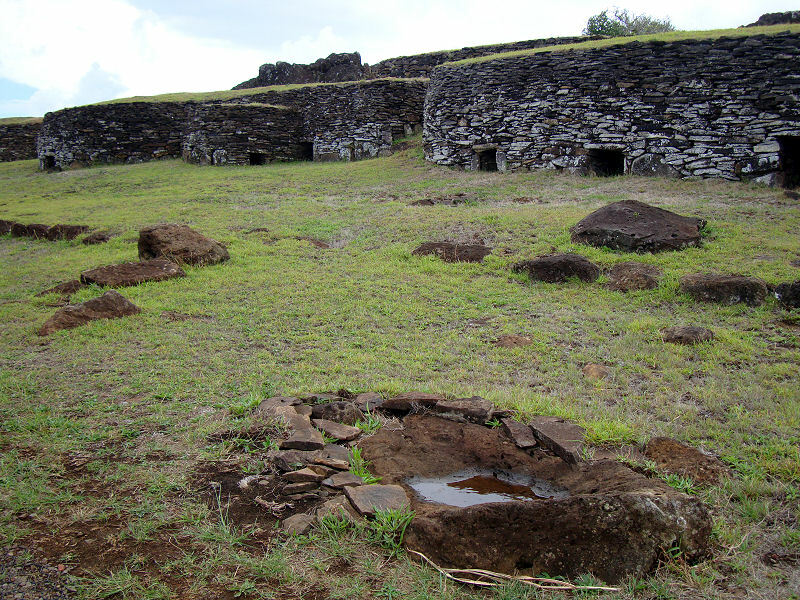 While the traditional timing of the landing is thought to be around 500 AD, recent researchers excavating the area put it closer to 1500 AD. 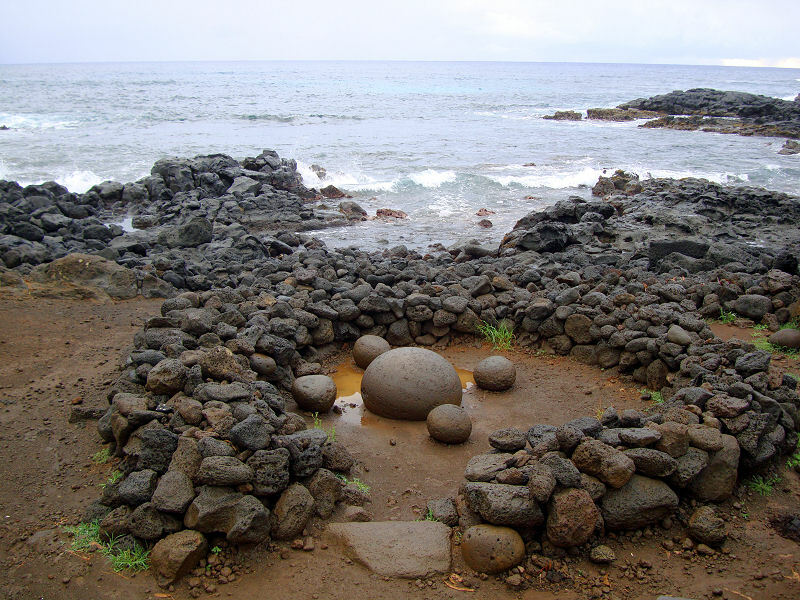 From these first colonists grew a clan-based civilization that is estimated to have reached 20,000 inhabitants at its peak. 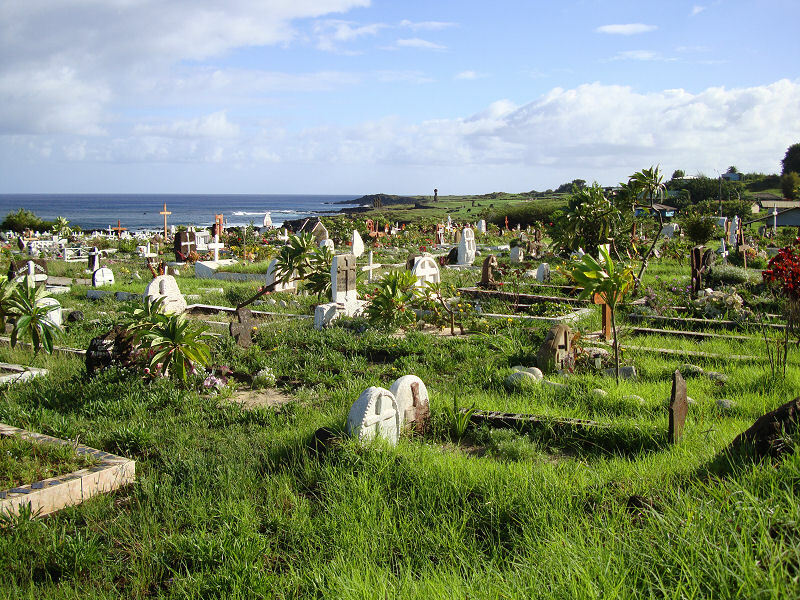 Famine, civil war, disease brought by European contact, and the slave trade would eventually cull the population down to slightly more than 100 islanders at the end of the 19th century.